From the car window, travelling at forty-five miles an hour on a lonely country road, the building appears plain. As in plain-spoken, plainly designed, devoid of flourish, uniqueness. 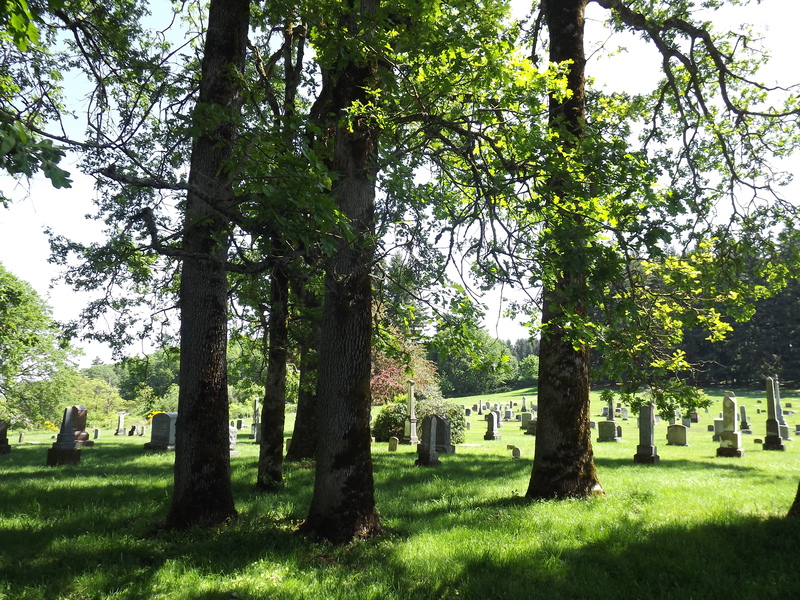 Gravestones are glimpsed between trees. It captures my attention instantly but we go on. “Turn around,” I say to Marc, who is intent on getting to the Oregon coast. He frowns. I often ask him to slow down or stop and let me get out. My cameras are in my lap, readied. He turns the car around and we pull into a narrow gravel road. Two other vehicles are there, a black truck and a Washington vehicle, an ivory Cadillac. Our car idles, half-off the road. Marc sighs heavily, sits back as I open my door and step out. I sense he doesn’t care for graveyards. I’m not one to make a habit of routinely roaming burial grounds, either, but they are what they are. Purposeful. And I am so drawn to this country acreage full of lemony light and mammoth, arching trees, and places marking lives of those passed. To this church with no cross. I notice a sign but continue. There are voices coming from the unadorned building so I enter quietly, not wanting to interrupt. 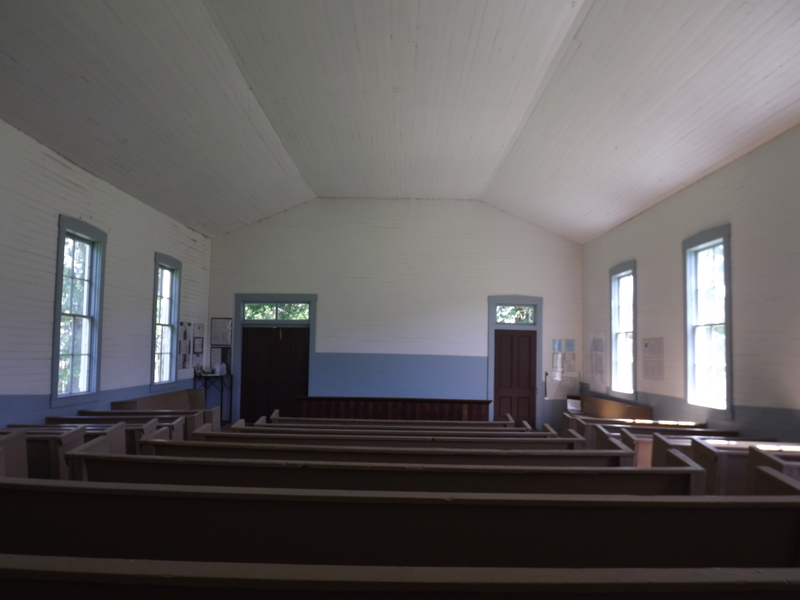 Inside there is a large rectangular space filled with wooden pews. At front there is a raised platform where one might hold forth on the one who has departed or everlasting life. But there is no pulpit, altar, cross here. Instead, a little girl of about four in a pretty spring dress and matching shoes is sitting there. She is asking an older woman, likely her grandmother, about water in a big jug. “Amen!” I respond and she laughs, waving the rose in her small fist at me. “Seems so,” I agree, smiling at her but she turns away. The little girl loudly dissents as her grandmother picks her up and exits the building. I can hear her screaming and the grandmother being very stern. 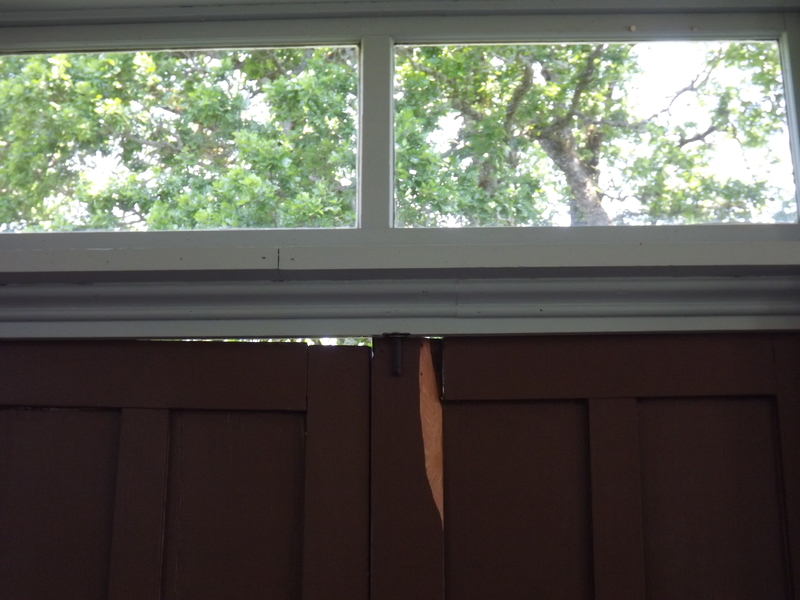 Then, after a car door opening and closing, quietness. I take a seat on a back pew. There is a wafting of breath from one end to the other, time heavily woven from past to present with people stung by grief and connected to lives made, then unmade. Such agedness in these walls, on this hill. The place is made of history, pioneers who huddled and prayed in the dark of winter in this space, then buried those who could not survive. The centuries passed and more arrived with those long-lost, abandoned, taken by illness and age. The perished. Yet the large room vibrates with life. 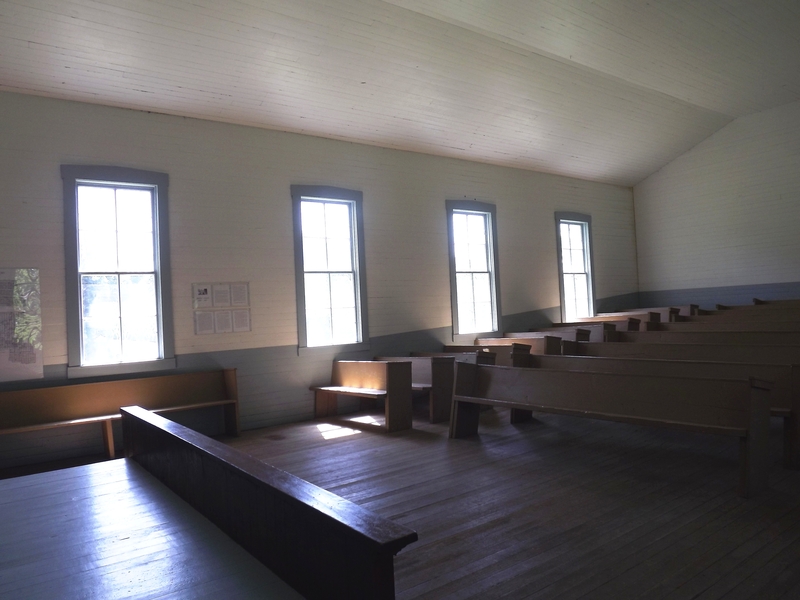 Light scours hardwood floors, warms the bare wooden pews. 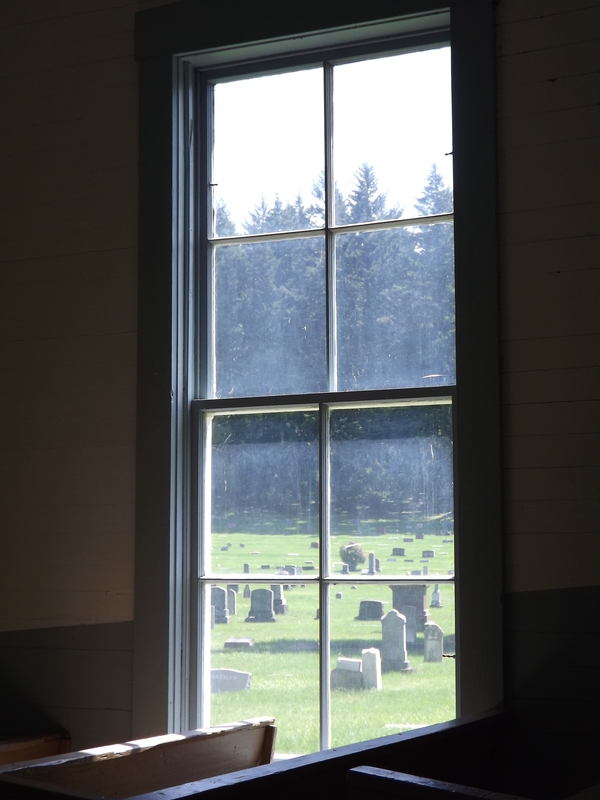 I can see gravestones through smeary windows. Yet there is something left of themselves, collective energies that linger. How much resilience does it take to return home without child, wife, a dear neighbor whose company and skills were valued? To adapt to a wild land that demanded as much as it shared? Then the twentieth century dawned. Life kept moving on: big and smaller wars, civil rights marches, asssinations, famine and pestilence, free love, “God is Dead”. Terrorism. Inventions and equal rights, moon landings and holograms and life-saving discoveries. Virtual love. Such changes, yet so much sameness. The devastation and also progress people must endure! We are as fragile as we are mighty. The brevity of life is a flame, powerful enough to instigate shattering change, brilliant enough to illuminate the mysterious dark. But always flickering, finite on this earth. My mind stills. I am breathing in words spoken by others, sitting where tears have freely fallen and hands were tightly held. I am moved, one more to tarry in this place. I have not sung in ages, not in a large open space, not with intention and from a place of raw need; I am a singer who lost much of her voice long ago. But I begin to sing. The old chorus wells up in me, a force that must be released. yes, then I shall be free! The room echoes, resonant with a power I have not experienced vocally in many years, as though my voice and that song were waiting to find this room. Tears spring from my eyes. I understand I am meant to meditate here, open my heart and soul further. Be in peace. Honor living and the dead. This life I am given is just one more life, but it needs to be shared without fear, generously, before my own time runs out. I register this without sound or language; God’s presence lights me up within. Vibrates in the room. I seek out Marc. He is reluctant until we read the plaque and then he is impressed. The site of Miller Church and Cemetery is on the National Historic Register. 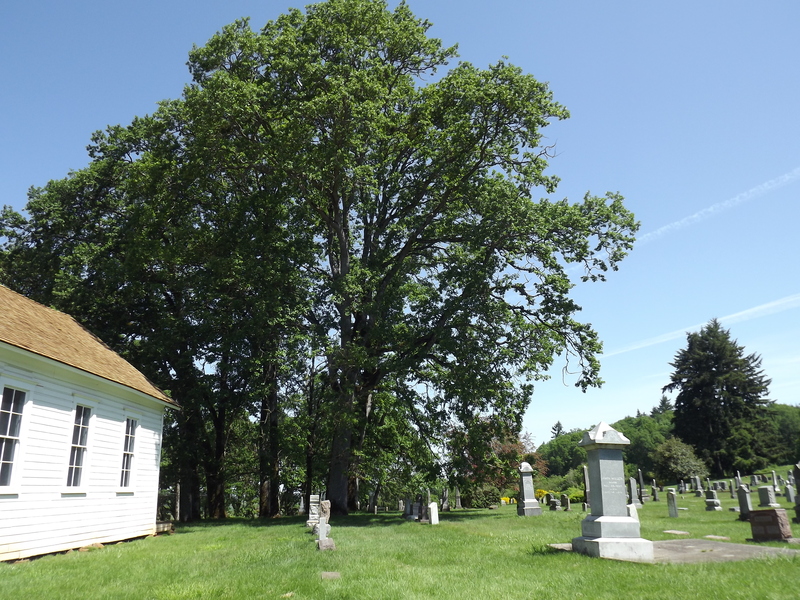 The land for the cemetery was given to the Abiqua community in 1860 by Richard Miller in “love and consideration” for a public burying ground. 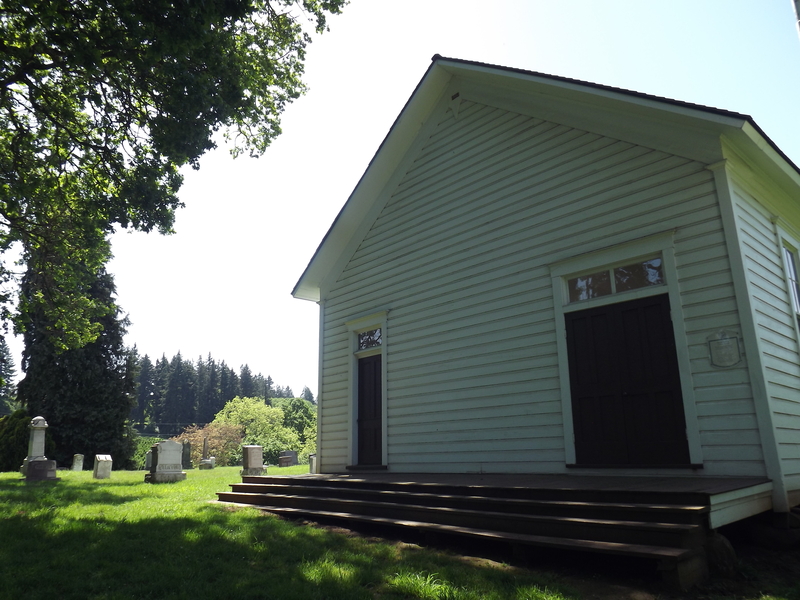 The structure was built in 1882, and is a good example of a pioneer burying church. We like that it has been a democratic cemetery, not just for those of note or wealth. Inside we move and speak softly and then I again sing the gospel tune, his tenor harmonizing. It is recorded and catches a subtle tearfulness that is not born of grief so much as tenderness. Some day I may share it with my children and grandchildren, this space, the song and feeling. That God hears seems clear as my flesh and being are touched by gentlest sorrow and undercurrents of ecstasy that linger the whole day. Outdoors we find notation of abbreviated lives on many tombstones from long ago to the present. I stop before Jane Jett, who died Dec. 31, 1876 at 49 years. I feel a poem for her coming on and want to write. It is time to leave. We listen to the wind in treetops and ponder lives once endowed with weakness or vigor. Which ones were shaped by pain, perhaps revenge or the persistence of hope? How many were altered by profound longings, love and wonder? Someone comes near. Edna Kelly. My mother. My breath catches in my chest. On this day thirteen years ago she left our worldly realm for God’s other places. I close my eyes until she passes on once more. The intensity of my recognition must also slip away before I go forward with my day. I watch church and graveyard recede from my car window. I feel myself deepen. Become a little freer. Humbled. Glad to have made another seemingly random stop along the road. Your heart-felt story has moved me. I don’t think that your presence at the chapel was random at all—you were meant to be the conduit for this message and your talent for writing helps us to experience it with you. Thank you kindly, Allan, for saying so. Yes, “random,” is not often truly random, perhaps. Or randomness serves to connect the dots, so to speak…I am heartened that you were moved by what I shared and appreciate your good words. Regards and come back sometime. Perhaps we might view “random” as “unplanned”? Yes, likely the correct dictionary view. Good response, thank you! This is amazing. You have great talent. Do you mind taking some time trading my memior on my blog? It’s the first one I’ve ever l made public. Reblogged this on Heres a glimpse..